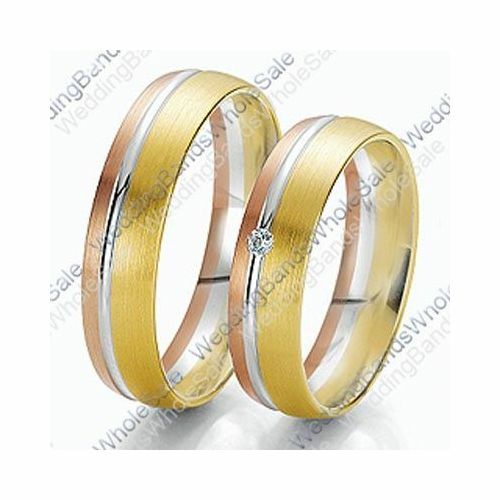 This 14k Tri-Color Rose, White & Yellow Gold .03ct His & Hers Wedding Rings Set is 7mm wide and approximately 2mm thick. The bands are rounded on the inside, creating a comfort fit for constant wear that will not pinch and still slide easily on and off of the finger. 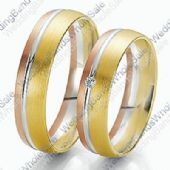 These beautiful hand made designer wedding bands are crafted in a tri-color design with 14k white, yellow, and rose gold. The bands are designed with rose gold channel in a satin finish followed by a shiny finish white gold channel and then a yellow gold channel with a satin finish. HER band features one small round brilliant diamond placed along the center of the band in the white gold channel adding an extra shine to her band.